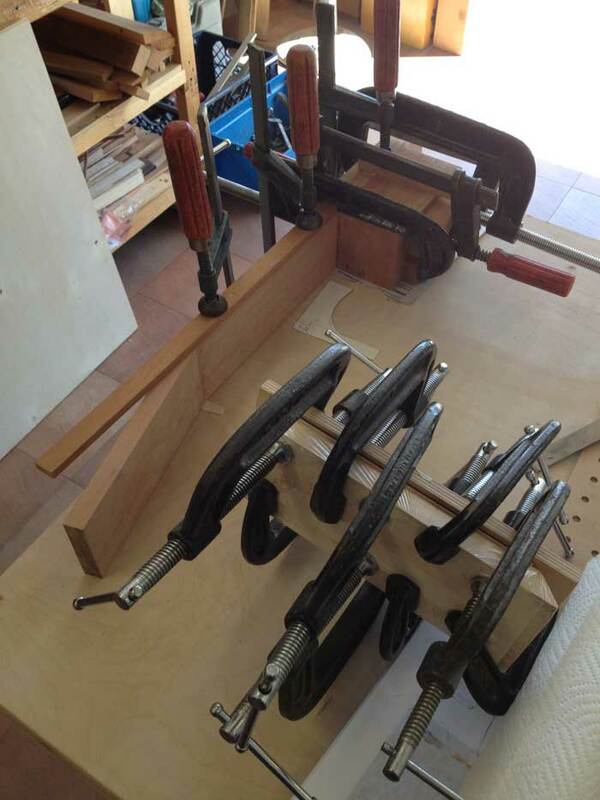 I have been meeting with Hans twice a week now constructing my Flamenco Negra guitar. 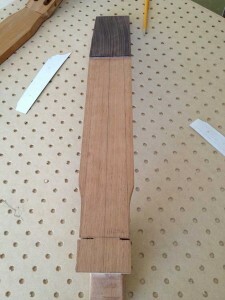 First step was to get the neck cut and glued. hans walked me through the process of cutting the blank at a 13 degree angle then flipping the cut piece to form the headstock. Ok, I get it now. So far so good – not to bad. 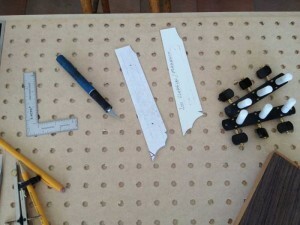 Now we glue the two pieces together and wait overnight. I opted for two veneers : a maple veneer sandwiched between the Indian Rosewood headstock veneer. A nice touch once the tuner slots are cut. During this process we trued up the soundboard book-matched pieces, glued them together to make the top,cut the shape, and sanded the top to “almost” desired thickness using Han’s homemade thickness sander. To this point, most of the work is done by hand with planes, sanding blocks and hand saw. This is incredible for me. I have the utmost respect for Hans and his craftsmanship. 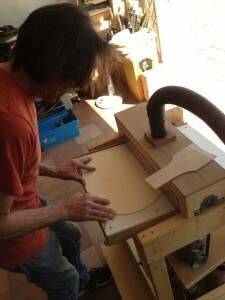 It truly is an art to build a guitar, and the level of skill needed to be a Master Luthier is incredible. Here are a few pictures of the process. Enjoy! 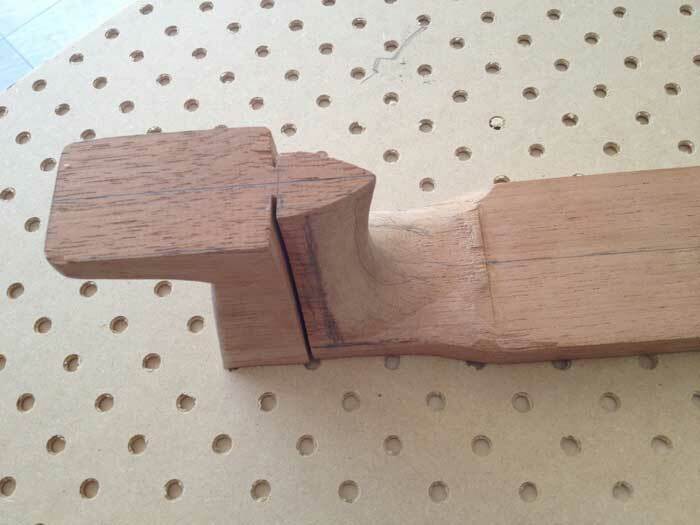 The basic shape of the traditional Spanish Heel and Heel Block. Hans puts masking tape on the veneer as Rosewood is difficult to see the pencil lines for the headstock shape. The headstock shape I created – getting the measurements correct. Neck, heel block and headstock veneer all glued up and ready. 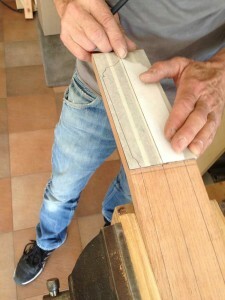 Hans sanding the top to thickness. Neck and Headstock Veneer being glueud up. 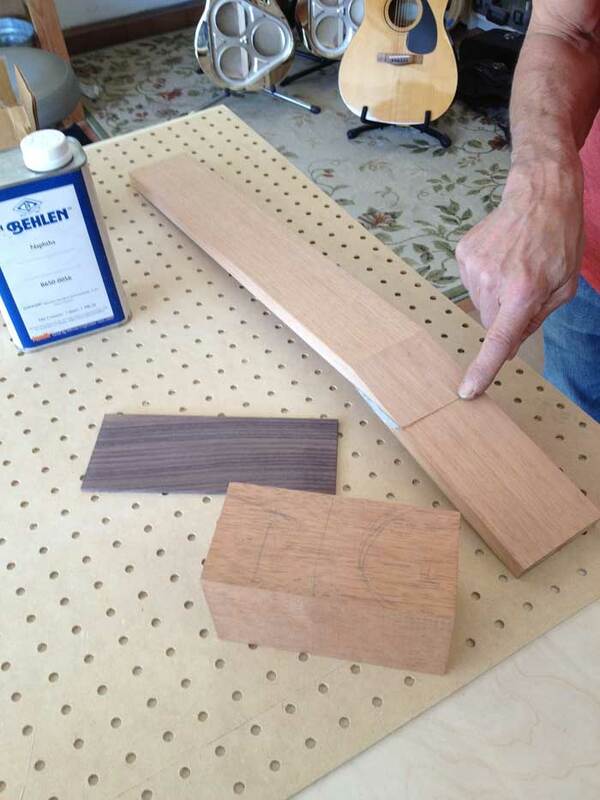 After cutting the neck blank at a 13 degree angle, we flipped the headstock piece to be glued.